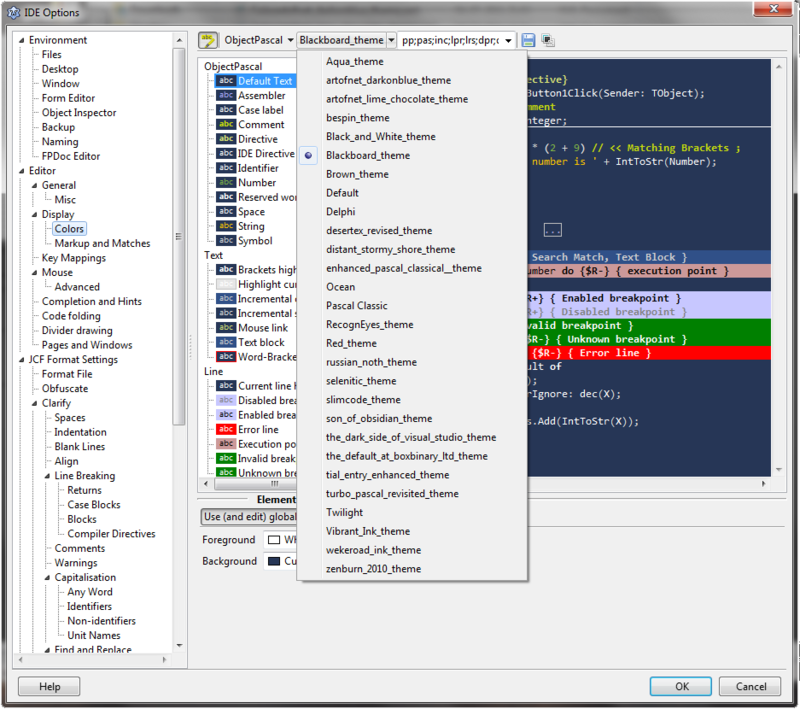 The Delphi IDE Theme Editor now supports the Lazarus IDE , so you can use any of the themes included in the installer or make your own theme. 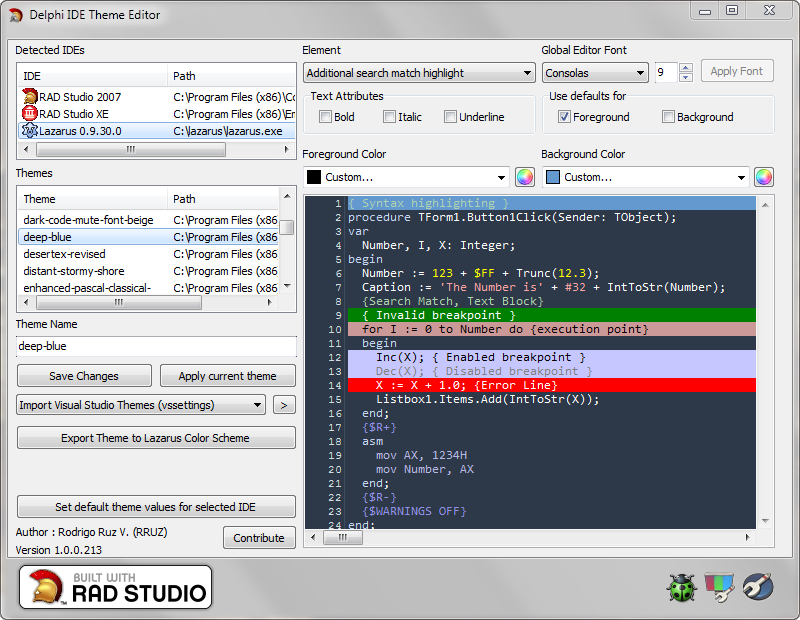 you can add the themes to the Lazarus IDE coping the generated themes (check the Themes Lazarus folder in the installation path or download the included Lazarus themes from here) to the primary_conf_path/userschemes/ folder (example in windows vista the folder is C:\Users\<Windows User>\AppData\Local\lazarus\userschemes) or let to the tool apply the current theme to Lazarus IDE. Categories: Applications, Lazarus | Tags: Applications, Lazarus | Permalink. 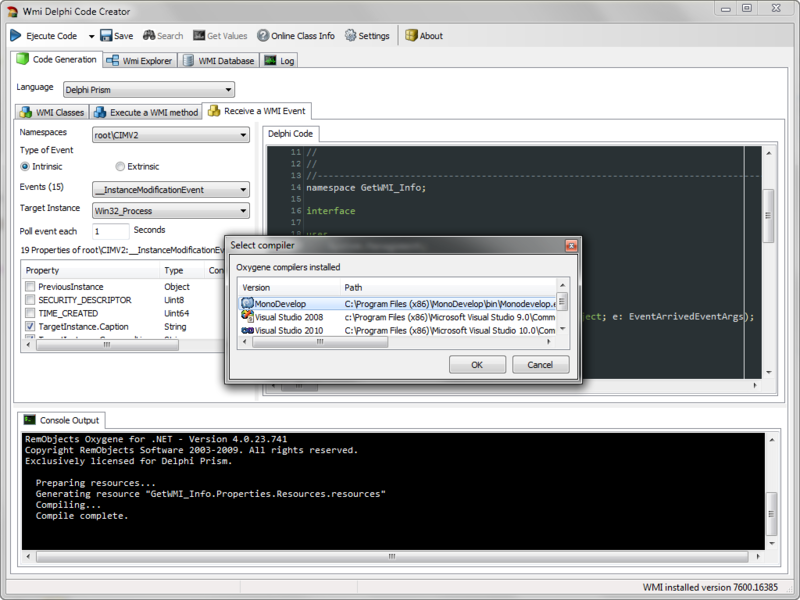 To download the last version of the delphi preview handler check the new page of the project. The current beta version of the preview handler (DelphiPreviewHandler.dll) is 1.0.1.168 please check the version installed before you report bugs. 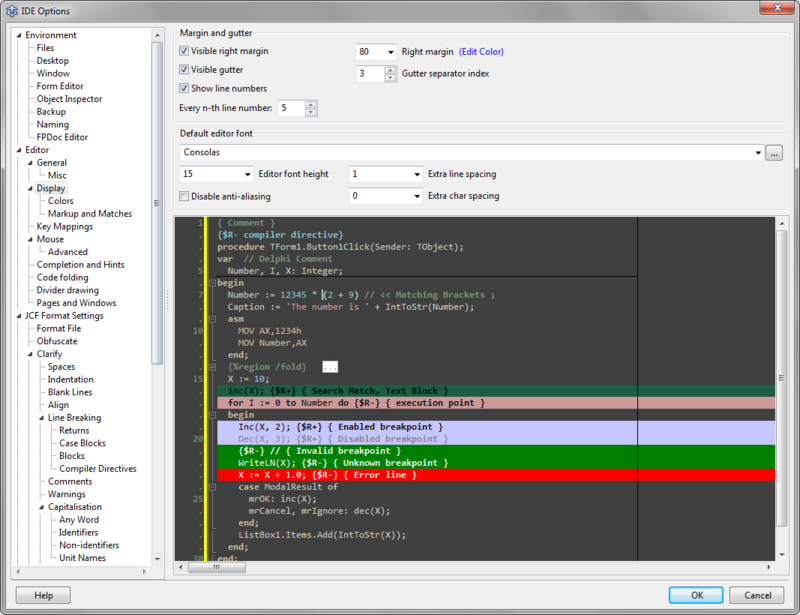 Some weeks ago I began a parallel project to the Delphi IDE Theme Editor, I name this project Delphi Preview Handler, which basically is a preview handler for windows vista and 7 which allow you read your object pascal, C++ and Assembly code with Syntax highlighting without open in a editor, this preview handler can render these file extensions .pp, .lpr, .lfm, .lpk, .inc, .pas, .dpr,.dfm, .dpk,.dproj, .bdsproj,.c, .cpp,. cc,.h, .hpp,.hh, .cxx, .hxx, . cu, .asm. Supports Windows Vista y Windows 7 32 and 64 bits. Support these file extensions .pp, .lpr, .lfm, .lpk, .inc, .pas, .dpr,.dfm, .dpk,.dproj, .bdsproj,.c, .cpp,. cc,.h, .hpp,.hh, .cxx, .hxx, . cu, .asm. 1. Choose Start > All Programs > Accessories. 2. Right-click on Command Prompt, Select Run As Administrator, and Authenticate. 3. Go to Delphi Preview Hander folder in Command Prompt. In order to avoid problems you must follow these steps when you install or register a new version of the preview handler. 3. If you install the preview handler manually you must unregister using the UnRegister.bat running as admin. 4.Now proceed with the installation of the new version. All your suggestions and comments are very welcome. Categories: Applications, Delphi, Lazarus, PreviewHandler | Tags: Applications, Delphi, Lazarus, PreviewHandler | Permalink. The lasts weeks I’ve been working in a new project, called Delphi WMI class code generator. let me tell you about it. The WMI (Windows Management Instrumentation) is formed by many classes, this classes exposes properties and methods. Also each class, property and method have qualifiers which are something like attributes, these qualifiers include descriptions about the classes, method, parameters or properties, types and many more useful information. Now to access the properties of a wmi class from object pascal code is a very easy task, as was shown in this post, but by the other side to access the methods is little more complicated, because you need to known if the method is static or dynamic. also you must deal in some cases with complicated parameters which must be variants arrays, objects or datetime (in UTC format). and finally some of these parameters can be optional. so if you are only an occasional user of the WMI you must figure out a lot of thinks before to use it. Because that and to the experience gained when I wrote the WMI Delphi Code Creator application, I decided to go a couple of steps forward and create tool which facilitate the access to the properties and methods exposed by the WMI classes from Object Pascal code. The result was a code generator which parse the very rich meta-data of the wmi classes and extract the properties and methods and convert into a Object pascal class. Now Let me show a sample code generated by the tool for the Win32_Share Wmi class. /// The Win32_Share class represents a shared resource on a Win32 system. This may be a disk drive, printer, interprocess communication, or other shareable device. /// The AllowMaximum property indicates whether the number of concurrent users for this resource has been limited. /// Values: TRUE or FALSE. A value of TRUE indicates the number of concurrent users of this resource has not been limited and the value in the MaximumAllowed property is ignored. /// The Description property provides a textual description of the object. /// installed. A lack of a value does not indicate that the object is not installed. /// The Name property indicates the alias given to a path set up as a share on a  Win32 system. /// The Path property indicates the local path of the Win32 share. /// The Status property is a string indicating the current status of the object. /// line, yet the managed element is neither "OK" nor in one of the other states. 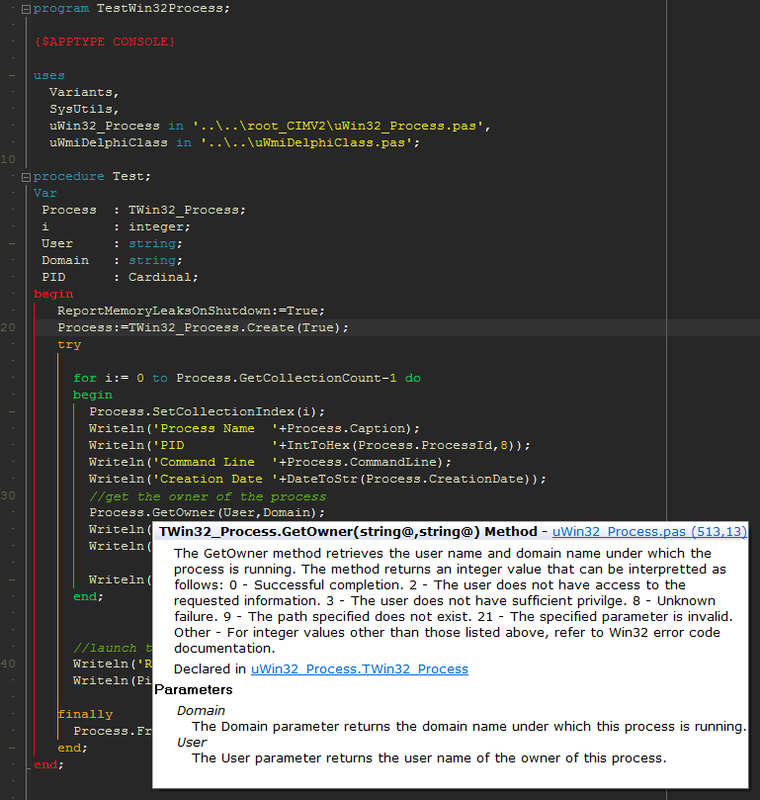 as you can see the generated code is a full documented class compatible with the delphi help insight feature, available since Delphi 2005.
check this screen-shot which show the help insight for the Getowner method of the Win32_Process class. This tool not only facilitate the access to the wmi, also give you information about every single WMI class, method and property. Create full documented classes compatible with the help insight feature, available since Delphi 2005. Note : the language of the description of the methods, parameters and properties depends on of the language of the windows where you generate the units. Create additional helper functions to retrieve the description of the returned values for the properties and functions. Support access to the WMI of the remote computers. Now see this sample application which uses a class generated by the tool to access the BIOS information of a Remote PC. RemoteBiosInfo:=TWin32_BIOS.Create(False); //Create a instance of the TWin32_BIOS, the false value indicate which not load the Values when calls the constructor. You can found more information about the internals, the full source code, demos and samples of this tool in the google code project page. See you, and happy new year. Categories: Applications, Delphi, Lazarus, WMI | Tags: Applications, Delphi, Lazarus, WMI | Permalink. Due to many developers don’t know how access the WMI from Pascal code, I decided to write this entry to show a simple set of samples using Delphi Win32, Delphi.Net, Oxygene and Free-pascal. Delphi win32 importing the Microsoft WMIScripting Library. All the code samples uses the Win32_BaseBoard wmi class and are console applications just for simplicity. The code showed in this entry can be optimized a lot for experienced developers, these simple piece of code only pretend give a basic idea which how connect to the WMi service and retieve data using a WQL query. This is the Managed Object Format (MOF) representation of this class. 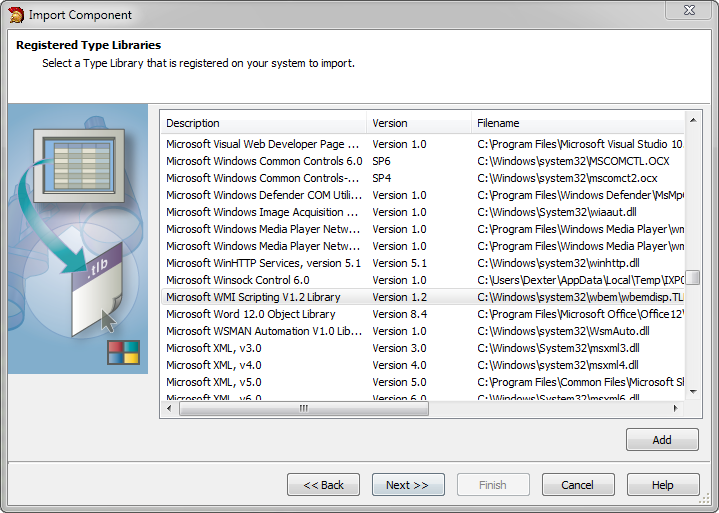 Check the picture to see the Microsoft Wmi Scripting library organization. 2) Establish a connection with the WMI service in a local o remote computer. using the TSWbemLocator.ConnectServer function. 3) Execute your WQL Query using the ISWbemServices.ExecQuery function which returns a instance to the ISWbemObjectSet object. so using a IEnumVariant (which is part of the ActiveX unit) variable we can obtain the enumerator to the collection in this way. 1) Full access through the IDE (code-completion) to the types, enumerations and constants of the WMIScripting Library. 2) easy to debug syntax errors which would have been missed had you used late binding. 1) Depending of the Windows version which you uses, you can get different results when you import the WMIScripting Library, check this link. 2) The final exe size is incremented when you import this library. Check the full sample source code to get a idea how use this method. Another way to access the WMI is using a Moniker, to do this we need to use the IBindCtx and IMoniker interfaces. 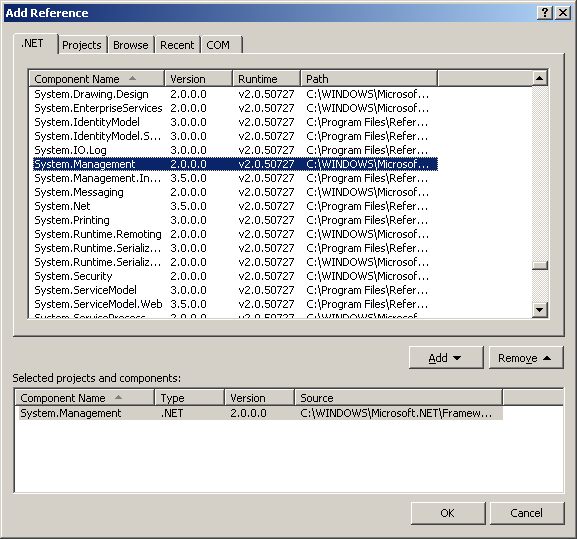 Check this sample to create a wmi instance using these interfaces. See the snippet, is very similar to the used when we import the WbemScripting_TLB unit. but the main difference is which all the variables are declarated as Variants (OLEVariant) because we don’t have available the types, enumeratios and constants of the WbemScripting_TLB unit. 3) finally to access a particular property we can get the value directly using his name. 1. Is a very flexible solution to access the WMI, and the code to manage the wmi objects is very close to vbscript, which is good because there are thousands of examples of vbscript on the Internet to access the WMI Data. 2. Another very important advantage is that code which uses late binding is more certain to be version-independent, because when you create a WMIObject using winmgmts you are not referencing any particular version of the WMI. 3. The final exe executable is small because you don’t import any wrapper. 1. You don’t have access to the wmi types, constants and enumerations from the ide, because the code is interpreted in run-time. so you can write something like this (which is wrong) and the code will be compiled anyway. the right version must be. 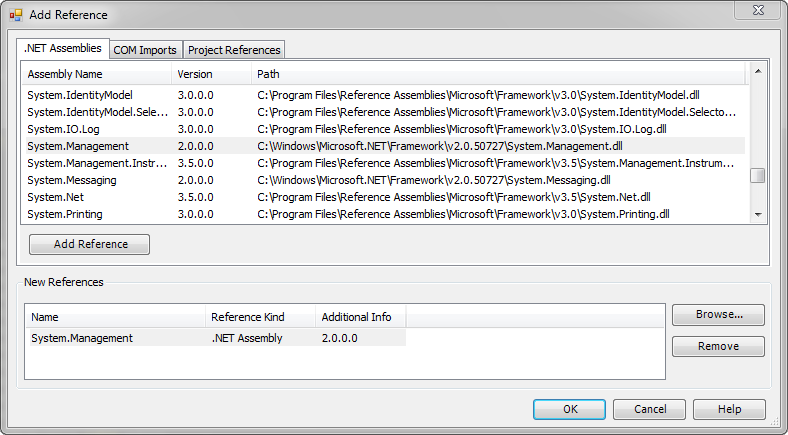 1) before to use the .net wmi objects you add the System.Management reference to your project. 2) Now we need make the connection to the WMi service, to do this you must use the System.Management namespace and the ManagementObjectSearcher class wich have several constructor to facilitate the connection with the wmi, this class is very versatile and let establish the connection and make a WQL query in a single step. Public method ManagementObjectSearcher() 	//Initializes a new instance of the ManagementObjectSearcher class. After some properties on this object are set, the object can be used to invoke a query for management information. This is the default constructor. Public method ManagementObjectSearcher(ObjectQuery) 	//Initializes a new instance of the ManagementObjectSearcher class used to invoke the specified query for management information. Public method ManagementObjectSearcher(String) 	//Initializes a new instance of the ManagementObjectSearcher class used to invoke the specified query for management information. Public method ManagementObjectSearcher(ManagementScope, ObjectQuery) //Initializes a new instance of the ManagementObjectSearcher class used to invoke the specified query in the specified scope. Public method ManagementObjectSearcher(String, String) 	//Initializes a new instance of the ManagementObjectSearcher class used to invoke the specified query in the specified scope. Public method ManagementObjectSearcher class //to be used to invoke the specified query in the specified scope, with the specified options. Public method ManagementObjectSearcher(String, String, EnumerationOptions) 	//Initializes a new instance of the ManagementObjectSearcher class used to invoke the specified query, in the specified scope, and with the specified options. 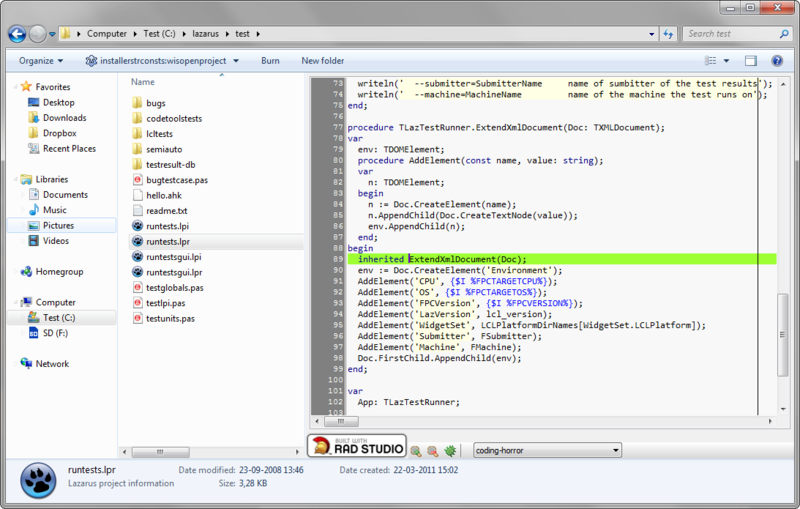 3) retrieve the data using the ManagementObjectCollection object. By far using .Net and delphi prism must be the easy way to access the WMI, because you don’t need to implement enumerators or helper functions to avoid nulls. 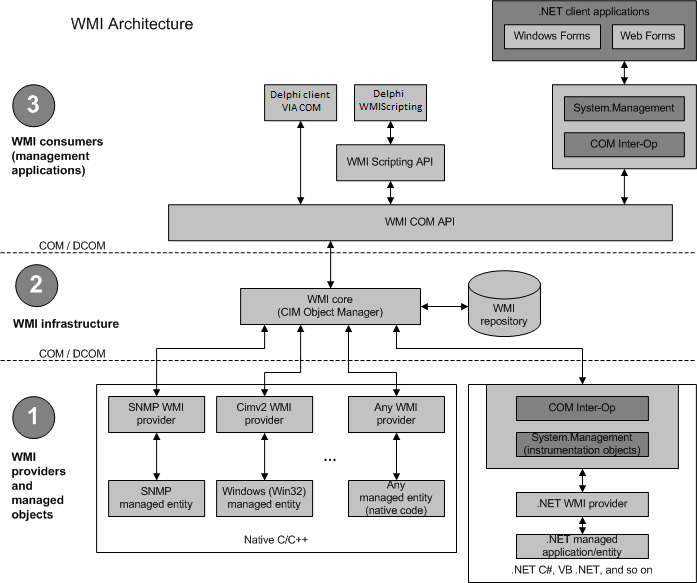 therefore exists many resources of the WMI and .Net in the MSDN site. 1) to access the WMI from .Net you add the System.Management namespace which give you full access to the WMI. 2) Now using the ManagementObjectSearcher class in a single step you can establish a connection to the wmi service and make a WQL query. for WmiObject : ManagementObject  in searcher.Get() do //in this single line you are creating a WmiObject to get access to the properties,and searcher.Get() return a enumerator that iterates through the ManagementObjectCollection. Finally the Source code of a Delphi Prism console application to access the WMI. The code necessary to access the WMI from Free-pascal using lazarus is very similar to the used in the Delphi win32 Late-binding., so i will show the differences only because the general idea is the same. 1) you must add the Windows unit to the uses clause because this unit contan the PULONG type which is required in some functions. 3) the helper function GetWMIObject must be modified to fit with the new types of parameteres required by the MkParseDisplayName function. 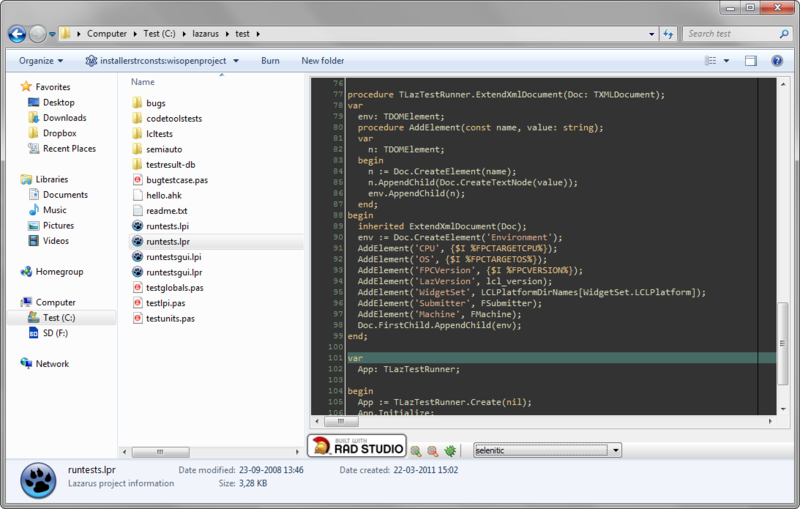 and the modified helper function now look like this. 5) finally if you wanna use the format function, you must aware which has some problems with variant values. so you must rewrite the code to show the info in this way. Categories: Delphi, Delphi Prism, FreePascal, Lazarus, WMI | Tags: Delphi, Delphi Prism, FreePascal, Lazarus, WMI | Permalink.